Many dogs display behavior changes after giving birth, and these changes can range from mild to extreme. 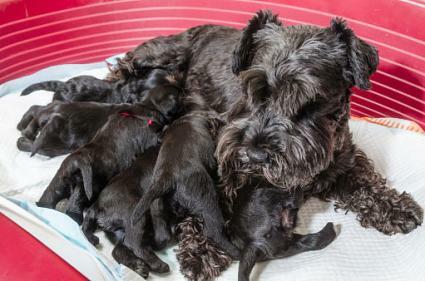 Depending on the cause, uncharacteristic dog behavior after having puppies rarely lasts more than a few weeks before a new mom begins acting more like herself again. The trick is understanding how to deal with the changes and care for your pet in the meantime. According to information published at Vetinfo, aggressive behavior is usually the result of a female's instinct to protect her pups. The behavior you might see can range from showing her teeth and growling to outright biting. This behavior usually appears within hours of giving birth as the new mother focuses on caring for her litter. She's tired, her hormones are fluctuating, and she may still feel some discomfort after the birth, so displaying a little aggression is fairly natural even though it's unpleasant. Try not to handle the new pups more than necessary. Let your dog do her job with as little interference as possible for the first week. Keep other people away from her whelping area, especially people she doesn't know. It's difficult to resist showing off the puppies, but there will be plenty of time for that later when they are about six to eight weeks old. Keep other pets away from her and the puppies. This includes other dogs who may have been her housemates. New motherhood trumps old relationships, but things should return to normal once the pups are self-sufficient. Avoid startling her by talking to her in a calm voice as soon as you enter the room where her whelping box is located. Aggressive behaviors usually begin to disappear within a week or two after delivery. If you feel unsafe around your pet, give your vet a call to find out if an exam and some medication might be in order. Anxious behavior is not quite so concerning as aggressive behavior, and it's not uncommon for a female to display some anxiety after giving birth, especially if it was her first litter. She may whine and tremble if someone comes near the pups, and she may even become a bit clingy with the person who is her primary caregiver. She might also tend to lick the pups too much, which can leave them wet and chilled. Talk to the dog in a calm, reassuring voice and keep the activity level in the room low. Feed her some high-quality canned dog food. A full stomach may help her relax and settle in with her pups, and the extra moisture in the canned food will help her produce milk. Softly praise her when you see her caring for her pups, such as nursing or cleaning them; this will let her know her she's doing the right thing. If she cleans/licks them too much, distract her from this task for a while by stroking her head and talking to her. This may help her relax and let the puppies settle against her for warmth. Most new moms settle down within a day or two of giving birth as they get used to their new duties, so it's usually not necessary to call the vet unless the anxiety seems excessive. 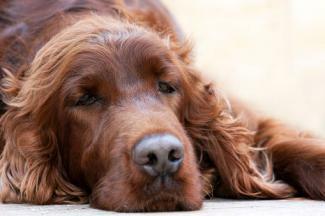 If your dog seems especially restless and trembles constantly, these could be signs of eclampsia, and she needs to go to the vet clinic immediately. It's natural for a female to dig up the paper and blankets in her whelping box as she attempts to make it more comfortable for her and her new pups. If she begins digging outside of the box, however, this can be an extension of anxious behavior. It's usually a sign she feels her pups need to be moved to a more secure place. If that's the case, she'll search for a secluded corner, a family member's bed, the inside of a closet, or some other out-of -the-way place and begin digging to create a new nest to transfer her pups. To avoid this behavior before delivery select a quiet, low-traffic area to set up her whelping box before she's ready to give birth. This gives her time to get used to the spot and feel more secure when it comes time to deliver her puppies. Leave her alone with the pups as much as possible and keep strangers and other pets away from her and her litter. Take her outside for a quick trip to relieve herself and get some fresh air. The activity may help her settle in better once she's back inside with her pups. Digging and trying to relocate pups tends to stop as soon as the female feels more secure, so address this issue as quickly as possible. Some females are perfectly calm and easily settle into caring for their pups, but lethargic behavior goes beyond being calm. A lethargic female will act sluggish and will neglect her pups. She may even lay on them and smother them accidentally. Lethargic behavior can be caused by an infection, such as mastitis, or some other post-delivery malady. If your dog becomes lethargic, place the puppies in a warm box to protect them and take her and the pups to the vet immediately for proper diagnosis and treatment. House accidents tend to happen for several reasons. A female may feel too weak and tired after giving birth to go outside to relieve herself, and she may also feel anxious about leaving her newborn puppies. Continued and frequent house accidents could also be a sign she has developed a urinary tract infection after giving birth. Spread newspapers or puppy training pads on the floor around the whelping box, and plan to clean up and replace them as soon as she soils them. Using one of her favorite treats, try coaxing her to go outside for quick trips to relieve herself. Have her examined by a vet if she has frequent accidents for more than a day or two after giving birth. If there isn't a medical cause for the house accidents, this behavior usually disappears within a few days of delivery after the female realizes it's safe to leave her pups alone for a few minutes while she goes outside. This is a very disturbing behavior that you hopefully will never face. In rare instances, a new mother will kill and eat her pups, and this can happen no matter how docile her typical behavior is. VCA Hospitals attributes this behavior to a primeval, protective instinct which can be triggered if the mother thinks her pups make too much noise and might attract predators. Remove any surviving pups and keep them in a box set on top of a heating pad set on low. Only put them with their mother for supervised periods so they can nurse. Keep a very close eye on her, especially if she begins licking them because a single bite can kill. Clean the pups yourself with a warm wet cloth to make sure they urinate and pass stools until they are old enough to eliminate without help. This behavior usually occurs within hours or a couple days of delivery while the pups are still newborns, and you should call your vet immediately after any surviving pups have been separated from their mother. Once a female has cannibalized her pups, it's best to avoid breeding her again because she will likely repeat the behavior. After the pups are running around, you can try keeping them with their mom for supervised periods to see if she will accept them. A post-pregnancy exam can reduce or eliminate medical issues that could cause a drastic change in the new mom's behavior. Cleary Lake Veterinary Hospital recommends all females should be examined by a vet within 48 hours of giving birth. This is to make sure all the puppies have been delivered, and the uterus is shrinking back to its pre-pregnancy size. In many cases, a vet will administer an antibiotic injection as a precaution against infection. Hopefully, you'll never experience any serious behavior changes after your dog has puppies, but keeping a close eye on her for the first week after delivery should help you spot problems and address them as they come up. 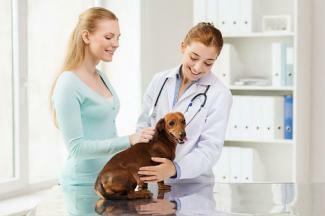 Don't hesitate to consult your veterinarian if you feel your pet's behavior changes are more than you can handle.